First, drop absolutely everything you may be doing, and listen to this. Back? Yeah, sorry, I should have warned you that it might induce stomach cramps due to uncontrollable laughing. “Now I’m jerking off and I know why…” Whew, I’m wiping tears from my eyes. Speaking of dissolution, I should mention that I have become so addicted to that website (online karaoke called Singsnap) that I think I might have to quit cold turkey. There is something sadly seductive about karaoke, let me tell you. I actually hauled my laptop into the bathroom this morning just so I could get some manual reverb on my microphone. Yes, I’m that sad. But I’ll have a new round of reviews up soon, since I’ve also been reading. It’s the writing that’s taken a bit of a hit for the last week, but I’m gonna have to get back on that saddle immediately (finally got a due date for Book 2 of Spirit Binders). Way too much to do, as usual. I almost like deadlines, because they give me a last minute to project myself against. Otherwise it’d be nothing but singing joints and eating…chocolate snickerdoodles. In case you were wondering where I’ve been. So, The Tour is over. I had a lovely, if exhausting, time. I had the fun experience of waking up to the sound of three police officers taking someone down outside the window of my hotel room. “Get on the ground!” they shouted while pointing guns. “Uh…but I am on the ground,” I muttered as I dragged myself out of sleep. LA is a nice place to visit, but I’ll never understand a city that doesn’t even pretend to have decent public transportation and yet also claims to be cool. On to San Francisco, which I approached by overnight bus, much to my eternal chagrin. Yet, I say, is it MY fault that our lovely Amtrak is so dysfunctional as to have NOT CONNECTED the TWO MAJOR CITIES on the coast of California by train? Why should I add more CO2 to th atmosphere by taking a fossil-guzzling plane? But next time I think the environment might just have to suffer, because I have never had less leg room in my life, and I include several domestic flights within West Africa. But once I actually arrived I had a lovely time, visiting with a good friend in Palo Alto, who in fact had just discovered that she has been accepted to academic servitude at UCLA (a.k.a. grad school). We celebrated by going to some docks and buying ludicrously delicious cheese and real SF sourdough, and then bringing the bounty to a wine bar, where we split a bottle of pink champagne. Joy! Drunkenness! Memorable moment: the two of us attempting to totter back to the commuter train in time, I decide to go sprinting down the median strip in the hopes of catching up to the fast-departing MUNI train, as though my desperate desire really could fold the fabric of space-time, I suddenly hear my friend’s voice shouting my name, but I don’t see her anywhere– hey, is that a car pulling up beside me, like I’m a second away from the bad guy capturing me in a thriller? “Get inside!” she shouts, improbably, from the back seat of a taxi. “Hey, how’d you get that?” I ask, getting inside. The cab driver seems disappointed that I am not, in fact, Ethiopian. In consolation, I tell him that I do love injera. The reading in Berkeley was nice–though not quite a reading, and the bookstore was like crack to a recovering addict. My god, all those books! I need to go back when I’m not toting all my luggage on my back like a turtle. Dark Carnival is a gem. Then a plane to Seattle, because of course I discover a mere week before I’m scheduled to leave New York that there has been some kind of natural calamity westerners call mudslides that has apparently rendered EVERY Amtrak train impassible until mid-March. Not helpful, I tell you. So a plane, mercifully uneventful, and I’m picked up by my other really good friend (seriously, in high school I had four of them, and one was my sister), who has moved to a swank, HUGE new apartment in Capitol Hill and we proceed to eat ridiculous amounts of good food and swill coffee. Bill loves coffee. I love coffee. We stayed up very late. I had a lovely time. I actually did read this time, and the word on the street is that I was rushing at the beginning but hit my groove a few pages into the chapter. More food and coffee and food (holy crap, the best crepes I’ve ever had in my life, I’m really not kidding. It’s a restaurant with precisely one employee, who takes the orders, makes the crepes, serves the food and gives the change. I’d go back to Seattle just for that). Yeah, Seattle is a great city. I’m still not sure that it beats out Vancouver for my wholly undesirable trophy of best West Coast city, but it’s close. Then this afternoon I take the super-secret Amtrak train from Seattle to Portland. Admittedly, it is dark and rainy and I don’t have the slightest clue where I’m going, but Portland is…weird. I ate dinner in an old church that was converted to a brewery and had the singular experience of eating gnocchi (after the waiter stared at me like I’d asked for escargots when I ordered it) while listening to some hard-up musical conservatory student play The Band and Led Zepelin on a church organ. Everyone clapped. The reading was great, though–very nice conversation, and someone who’d bought my book on Amazon after reading the first few pages. Then the pensioners/drunks/high schoolers bus, where I nearly missed my stop, and nothing I saw from the window did much to improve my impression of the city. HOWEVER, I am now typing this blog post from the free wifi available in the airport, so I guess I can’t complain. They’re boarding my plane now, so I guess I’ve got to go. Thanks so much to everyone who made my trip so great. Time to go home. A reminder to anyone in the San Francisco area, I’m going to be reading at Dark Carnival Books in Berkeley tomorrow. I hope you can come! February 15, 5:30. Dark Carnival Bookstore, 3086 Claremont Ave., Berkeley, CA 94705. 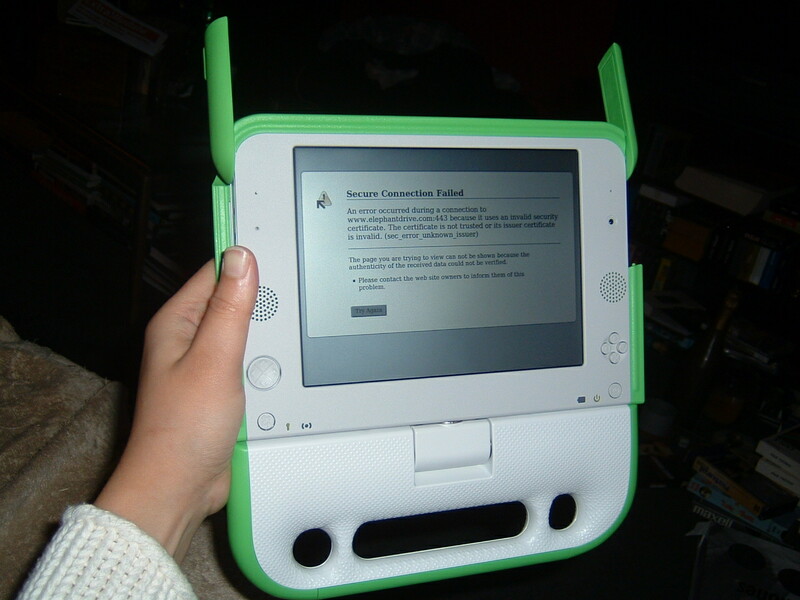 OLPC = One Laptop Per…toddler? So, at precisely 2:45 this afternoon, the FedEx man pulled in front of my apartment building and delivered the package that I’d been awaiting with about as much patience as a kid getting a Wii for Christmas. 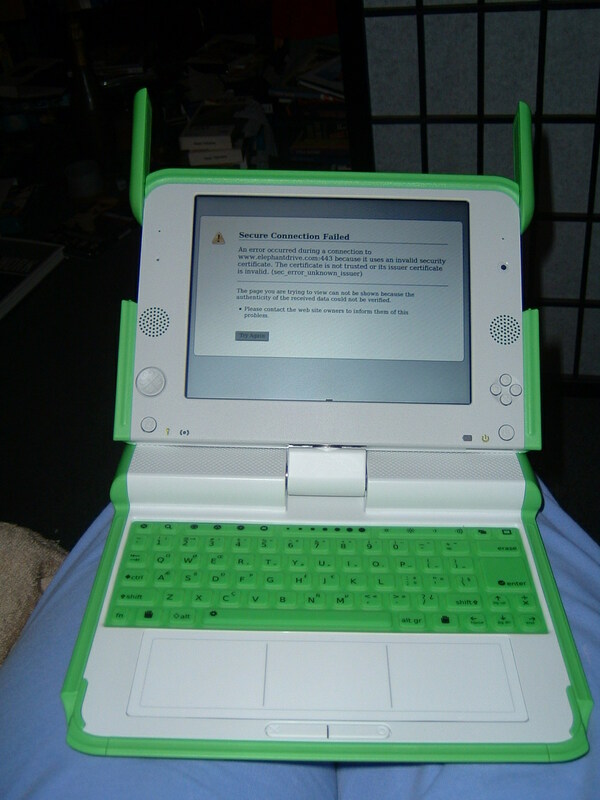 My very own OLPC XO laptop! It should have arrived five days before (a series of holiday screw-ups at the FedEx location in the Bronx) and so I practically pounced on the deliveryman as soon as he walked through the door. I dropped to the floor, tore open the tape and packaging and dumped the grail to the floor. My, I thought, that looks…small. 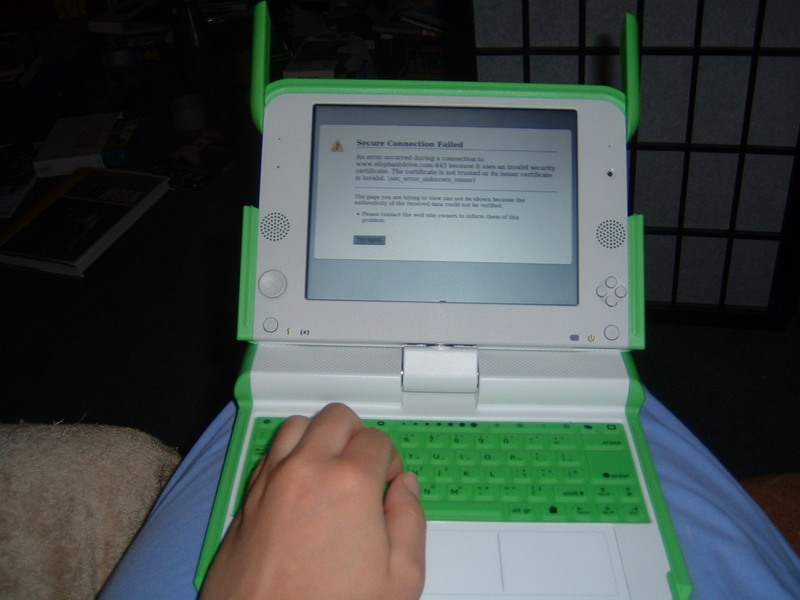 Right around now, all of the members of my writers group will be crowing “I told you so!” Okay, I knew what the “C” in OLPC stood for. 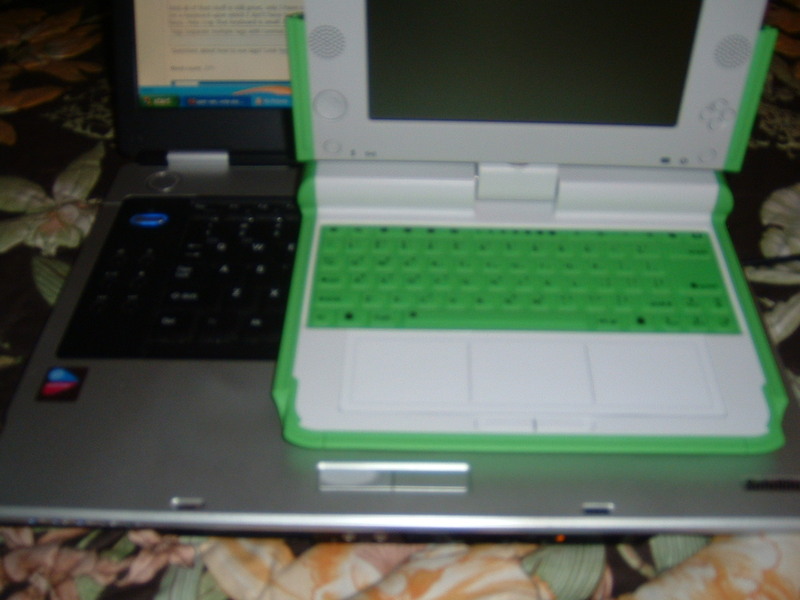 But I had read that the keyboard would be only 20% smaller than a normal-sized keyboard. My hands are tiny, I thought, no problem. And look at all the countervailing awesome: a spinning monitor that can fold back into a tablet for reading ebooks, 17-hour battery life, a screen that goes black-and-white for easy reading in daylight, water and damage resistant casing…I mean, it seemed like the perfect travel laptop! 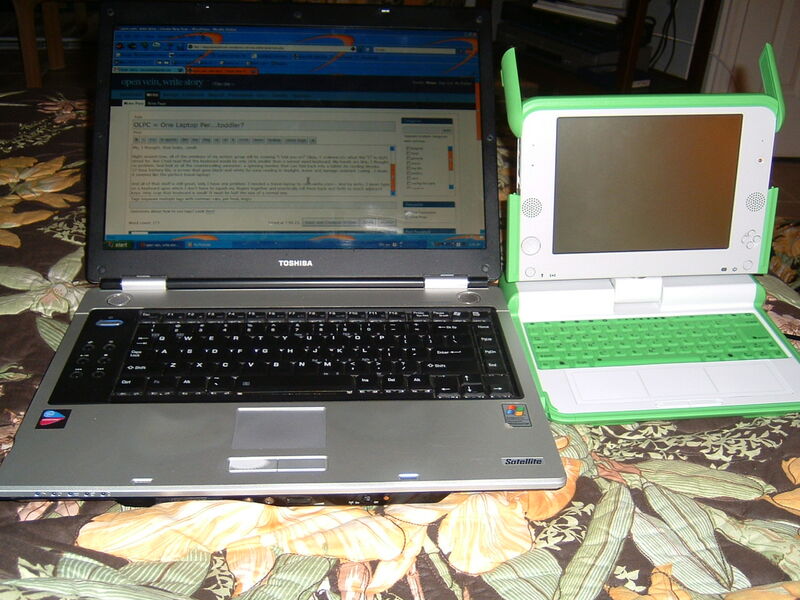 I guess I could get one of those folding portable keyboards and connect it with a USB. But that seems to sort of defeat the purpose of a lean, mean travel-typing machine. Should I sell it on ebay? Learn to type small? Endure the friendly cackles of my writer’s group? Back from Chicago. Great city (what little I saw of it, anyway). I went to a bar and my awesome friend Mariel treated me! (Very adult-like, I swear, though it’s a little weird when a 21-year-old college senior thinks she should treat you for drinks). Met a fanfic-friend AND a spec fic friend. Bill Shunn apparently did the public transportation equivalent of hiking the Himalayas to see me read, and for that I can only be grateful. I need to buy him a drink the next time he comes back to civilization (a.k.a. NYC). Chicago has 32 points! I had about 31 people at my reading, which is cool beans in my book of small fries. ETA: Forgot to mention that you should all go and check out K. Tempest Bradford’s very well done interview with me and Carole McDonnell, author of Wind Follower (out now from Juno books). And no, I don’t think that Neil Gaiman actually wrote an elf fantasy. It’s just that the trickster aspects of Anansi remind me of elves (a la Puck, not Galadriel). — But while I’m at it, Chicago, your school districts have some serious issues. Like, some school administrators who seem to think we are living in a proto-facist state. Hell, I think we’re living in a proto-facist state, but at least I’m not trying to speed along the process. Listen up, Superintendent Ben Nowakowski: the right to non-violent protest is one of the foundations of this country. These students cut class to protest a horrifying, illegal war. If you want to give them detention for cutting class, knock yourself out. But you want to expel them for exercising their constitutional rights, after administrators had already promised them that they would only be given detentions? Then I think that you, and your sorry, clueless school board needs to lose your damn jobs. What’s particularly sad about this, to me, is that these kids are using their education in a profoundly relevant manner. When I went to high school, you would have thought that the only purpose of the grinding hours of classes and homework and after-school activities was to get into the right college. That’s all I heard anyone talking about, anyway. “My Dad’s legacy, but I still have to be president of at least three clubs my senior year so I can get into Yale.” Community service was rarely about serving the community, it was about ticking off a box on an application. And apparently this soul-numbing view of education and its ultimate purposes has infiltrated the thinking of the highest officials in our school system. I can think of no other reason why these protesting students would be punished so harshly, vindictively and stubbornly (in the face of such public outrage). It’s a message: education is not about learning, or following your conscience, or applying your intellect to current problems. No, it’s about the personal essay, the supplementary materials and the teacher recommendations. Why else would they have given the “better” students more lenient punishments? I admire these Morton West students more than I can say. I never did anything like that in high school. I’d caught the prep school bug, I guess. Kids these days? About a hundred times cooler than I ever was. (-15 for a lousy school district, and +20 for kids with the guts to stand up to them). (btw, if you support what these students did and are horrified at what’s happened to them, please take a moment and sign the petition in their support. The school board is apparently going to decide on their fate in December). Chicago is 28 whole points of very, very cool. 32 if I don’t just give a reading to the bookstore staff. (And any scale that gives Chicago a 28 gives New York at least a 40 and DC about 38). Look, now I’m all excited about going there tomorrow. Chicago, here I come! Women and Children First. The listing for the event is here. Wednesday, November 14th at 7:30. If any of you happen to live in the Chicago area I hope you can make it. And that, I think, is that. Back to regularly scheduled programming when I feel slightly less blown out.